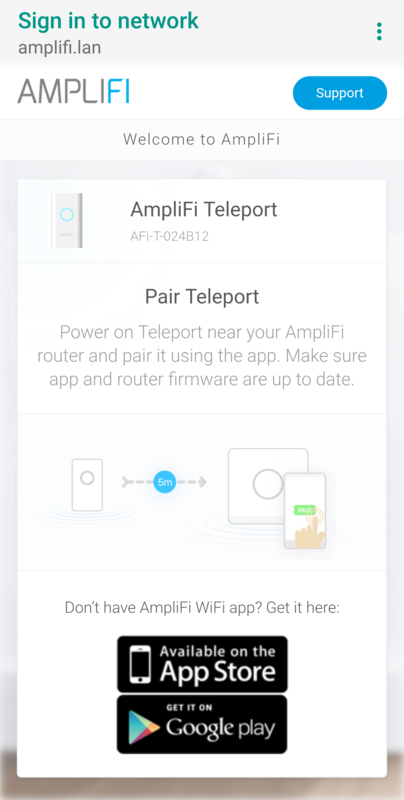 If I open the app while connected to the Teleport wifi, it says "AmpliFi devices not found." If I open the app while connected to my home wifi, it says "Everything is great". But I'm not getting the pairing request anywhere. It looks like this is because my teleport came as part of a pack. Is there a way to break the association between the router in the pack since I already have a full network setup with AmpliFi? @UBNT-Karlis: It looks like @Andrew-Kraut's teleport behaves like standalone, which it isn't. What's your understanding of the situation? The same thing with my teleport. Absolutly the same behavior. Has there been any resolution to this issue? I received a standalone Teleport yesterday and am experiencing the same behavior as described above. Please advise as to how to resolve. @michael-moore This post was in regards to a AmpliFi Teleport kit, you said yours is a standalone unit so the issue may be a little different. First, make sure your teleport is ready to be paired. The LED light on Teleport will have the top half flashing when it is ready to be paired. From there you can select to pair the devices.